Are you having trouble falling asleep? Are your kids hyperactive when playing with the tablet before bed time? Are you using your smart phone or tablet in the late evening? Twilight may be a solution for you! WARNING: Android O does no allow the app to cover your notifications any more.. Recent research suggests that exposure to blue light before sleep may distort your natural (circadian) rhythm and cause inability to fall asleep. The cause is the photoreceptor in your eyes, called Melanopsin. 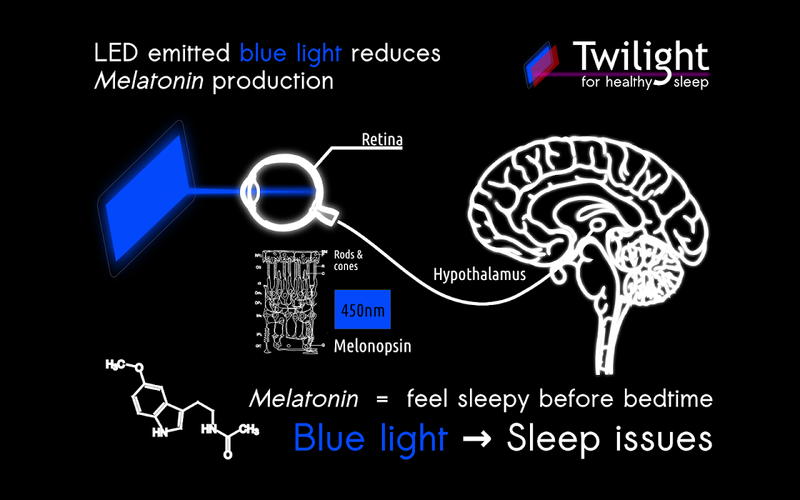 This receptor is sensitive to a narrow band of blue light in the 460-480nm range which may suppress Melatonin production - a hormone responsible for your healthy sleep-wake cycles. 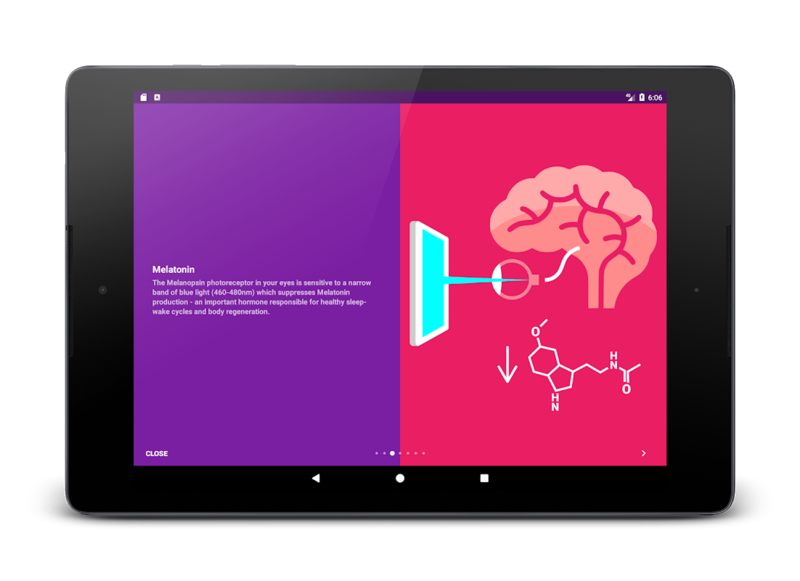 In experimental scientific studies it has been shown an average person reading on a tablet or smart phone for a couple of hours before bed time may find their sleep delayed by about an hour. 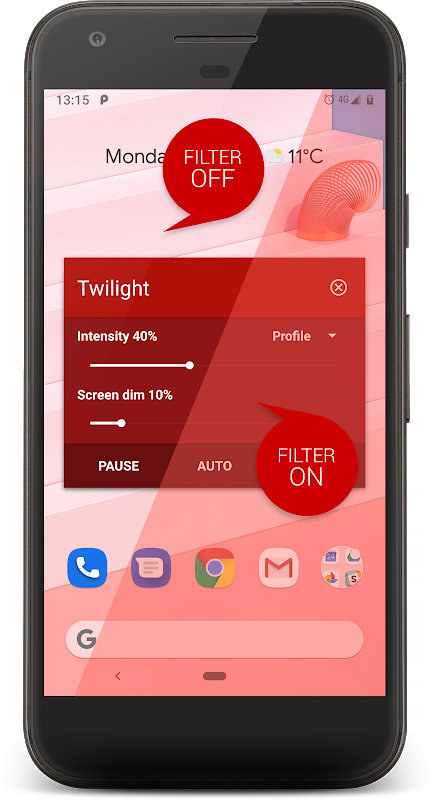 The Twilight app makes your device screen adapt to the time of the day. It filters the flux of blue light emitted by your phone or tablet after sunset and protects your eyes with a soft and pleasant red filter. 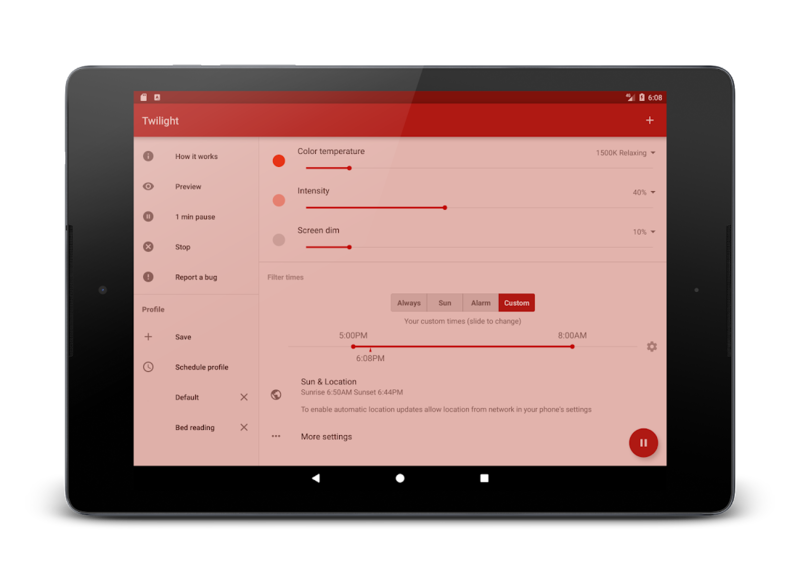 The filter intensity is smoothly adjusted to the sun cycle based on your local sunset and sunrise times. 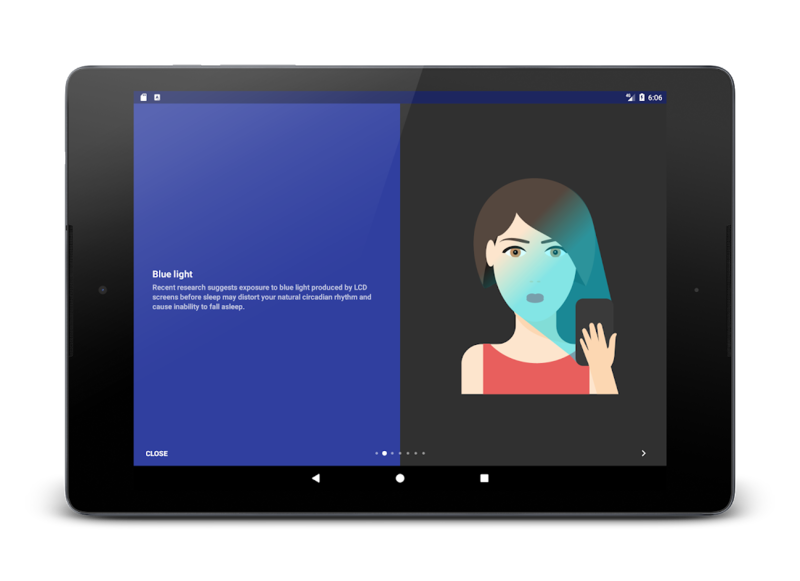 Documentation http://twilight.urbandroid.org/doc/ Get more from Twilight 1) Bed reading: Twilight is more pleasant on the eyes for night reading. Especially as it is able to lower the screen backlight far below the ability of the backligt controls on your screen 2) AMOLED screens: We have tested Twilight on an AMOLED screen for 2.5 years without any sign of depletion or over-burning. 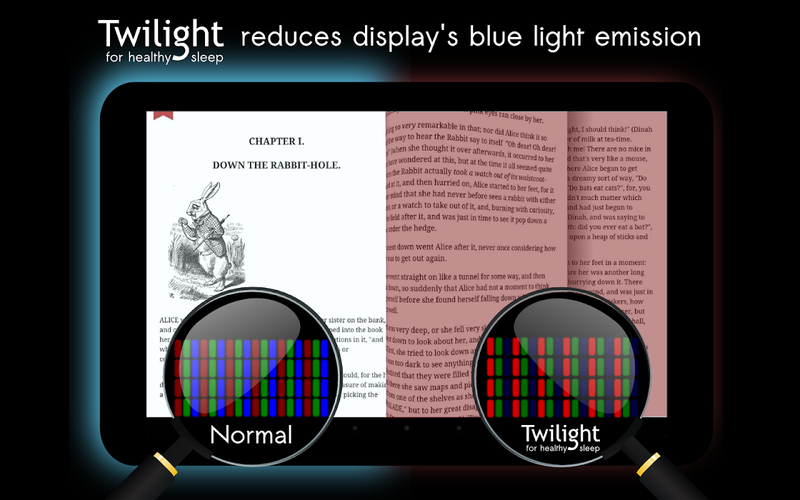 If properly configured Twilight causes less light emission (by enabling dimming) with more equal light distribution (dark areas of the screen such as the status bar get tinted). This may in fact increase your AMOLED screen life time. Basics on circadian rhythm and the role of melatonin http://en.wikipedia.org/wiki/Melatonin http://en.wikipedia.org/wiki/Melanopsin http://en.wikipedia.org/wiki/Circadian_rhythms http://en.wikipedia.org/wiki/Circadian_rhythm_disorder Permissions - location - to find out your current sunset/surise times - running apps - to stop Twilight in selected apps - write settings - to set back-light - network - access smartlight (Philips HUE) to shield you household light from blue Automation (Tasker or other) https://sites.google.com/site/twilight4android/automation Related scientific research Amplitude Reduction and Phase Shifts of Melatonin, Cortisol and Other Circadian Rhythms after a Gradual Advance of Sleep and Light Exposure in Humans Derk-Jan Dijk, & Co 2012 Exposure to Room Light before Bedtime Suppresses Melatonin Onset and Shortens Melatonin Duration in Humans Joshua J. Gooley, Kyle Chamberlain, Kurt A. Smith & Co, 2011 Effect of Light on Human Circadian Physiology Jeanne F. Duffy, Charles A. Czeisler 2009 Efficacy of a single sequence of intermittent bright light pulses for delaying circadian phase in humans Claude Gronfier, Kenneth P. Wright, & Co 2009 Intrinsic period and light intensity determine the phase relationship between melatonin and sleep in humans Kenneth P. Wright, Claude Gronfier & Co 2009 The Impact of Sleep Timing and Bright Light Exposure on Attentional Impairment during Night Work Nayantara Santhi & Co 2008 Short-Wavelength Light Sensitivity of Circadian, Pupillary, and Visual Awareness in Humans Lacking an Outer Retina Farhan H. Zaidi & Co, 2007 High sensitivity of the human circadian melatonin rhythm to resetting by short wavelength light. Lockley SW & Co. 2003 Sensitivity of the human circadian pacemaker to nocturnal light: melatonin phase resetting and suppression Jamie M Zeitzer, Derk-Jan Dijk & Co 2000 For a desktop alternative, try RedShift (Linux) or on Windows the app which has no relation to this project whatsoever, whose name cannot be said aloud or whispered as it is a Trademark, lets call it Lord Voldemort of the blue light flux filtering apps.Guessed it? Let us know in the comments.  Is Twilight: Blue light filter yours? Claim it!